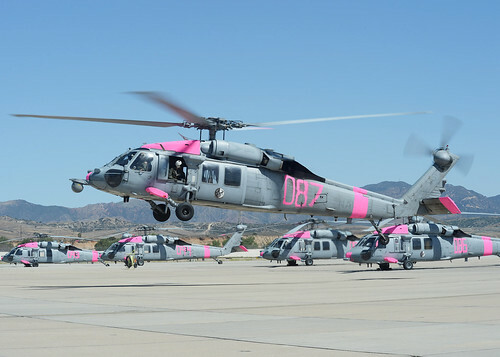 SAN DIEGO - Six flight crews from the "Merlins" of Helicopter Sea Combat Squadron (HSC) 3 provided firefighting support to California Department of Forestry and Fire Protection (CAL FIRE) in response to wildfires throughout San Diego County May 15. At the request of CAL FIRE, the six specially-equipped MH-60S Seahwaks are supporting firefighting efforts in the vicinity of Camp Pendleton, Calif. by conducting aerial water drops. "The critical part of our role is supporting CAL FIRE to help save lives, prevent human suffering and mitigate great property damage," said Lt. Cmdr. Todd Stansfield, Third Fleet's Defense Support of Civil Authorities (DSCA) lead. "We have Navy personnel and their families that live and work in the areas of San Diego threatened by the fires. Our efforts support both our people and the communities we live in." In August 2011, U.S. Third Fleet, Naval Air Forces Pacific and Navy Region Southwest entered into a memorandum of understanding with CALFIRE. Under the agreement, naval units provide helicopters when notified by CALFIRE of weather conditions favorable to wildfires. Helicopter Sea Combat Wing Pacific prepares ready, trained and certified resources to combat wildfires and crews conduct semi-annual training with CAL FIRE to ensure an immediate response capability in support of local authorities for emergency events. The assigned crews are capable of being airborne within four hours of receiving a request for assistance to combat fires. Navy helicopters will continue to assist in efforts to combat the San Diego County wildfires until CAL FIRE deems assistance is no longer needed. Joint, interagency and international relationships strengthen U.S. Third Fleet's ability to respond to crises and protect the collective maritime interests of the U.S. and its allies and partners.